The Cordillera Blanca is the highest mountain range in the Peruvian Andes and the highest tropical Cordillera in the world. The region's relatively easy access, excellent climate and friendly people make it perfect for climbing, and this challenging adventures provides some of the most spectacular opportunities that the Andes have to offer you. We have joined the ascent of the popular Alpamayo peak( 5947m) with Huascaran (6768m), Peru's highest mountain. You'll have the unique occasion to climb two of the most selected peaks in the Cordillera Blanca in just one challenging expedition. We approach the extraordinary pyramid of Alpamayo from the village of Cashapampa, and make our base camp in the Santa Cruz valley. The Santa Cruz valley is perhaps one of the most beautiful valley in the Cordillera Blanca. Day 1: Arrival to Lima. Hotel Accommodation in the Antigua Miraflores Hotel on the cool Miraflores neighborhood. Day 2: City Tour. Hotel Accommodation. Day 3: Bus to Huaraz (8 h). Hotel accommodation in the Andino Hotel. Day 4: Acclimatisation day in the colorful city of Huaraz. Day 5: Private bus to Cashapampa, the start point to Alpamayo peak. Trekking to Corral de Llamas Camp (3h). Day 6: Trekking to the Base Camp (4-5 h).4200m. Day 7: Trekking a Taulliraju Col. 5000m. Back to BC. Day 8: Rest Day for acclimatization. Base Camp. Day 9: Porters to Morrena Camp. 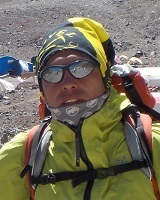 4900m. Back to BC. Day 10: Trekking to Morrena Camp. Night in the Morrena Camp. Day 11: Trekking to Collado Camp.Night in Collado Camp. Day 12: Early summit attempt. Alpamayo Peak 5947m. Descend to Collado Camp. Day 13: Descend to Base Camp. Night in Base Camp. Day 14: Descend to Cashapampa. Drive back to Huaraz. Night in the Andino Hotel. Day 15: Rest day in the town. Day 16: Driving to Musho. (5h). trekking to the Base Camp at 4200m. Day 17: Porters to Morrena Camp. Descend back to the BC. Day 18: Trekking to the Morrena Camp. Night in Morrena Camp at 4800m. Day 19: Ascend to C I at 5200m with porters. Night at 5200m. Day 20: Ascend to C II at 6100m with porters. Night at 6100m. Day 21: Early attempt to Huascaran South Summit 6768m. Back to C II. Day 22: Descend to the BC with porters. Night in the BC. Day 23: Descent to Musho. Driving back to Huaraz. Hotel accommodation. Day 24: Bus back to Lima. Antigua Miraflores Hotel. Day 25: Airport. Fly Back to Home.